Update: Taxes next year are going to skyrocket! If you don’t believe yet that the TEA Party is your ONLY hope to preserve Liberty and Freedom in America – welcome to socialist America. The mandate under the commerce clause was ruled unconstitutional, but Congress has the RIGHT to tax – even though it was never called a tax in the bill! The best bet for America is to move to one of the 26 states who fought. They aren’t required to expand Medicare and incur massive expense when the Feds quit kicking in on the funding. More than 60% of the population want it repealed, so Republicans will win in November. They will pass laws repealing all or part of the bill – hopefully all – to deconstruct the implementation apparatus already built. Billions of dollars (ours) and years have been wasted. Government is never the answer to problems and health care is no exception. 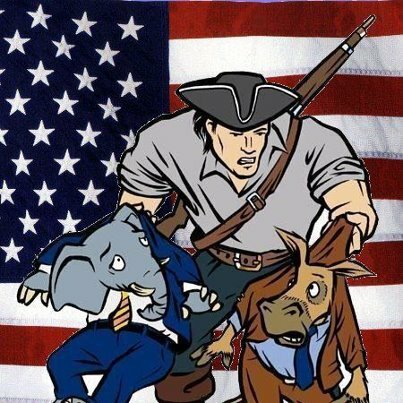 Democrats will whine about the radical Republicans thwarting the will of the people. Republicans whined when Democrats passed the bill. The REAL lesson here: Take time before deciding your vote. It has consequences. Hope and Change, the first black President, media recommendations, and “Feelings” don’t fulfill your duty as a citizen to make informed decisions to insure the Constitution doesn’t die. Better yet, let’s quit looking to government to solve problems. Depending on who is in power the solutions change, so do taxes and the social engineering of your life. Government can’t create “rights”. Health care is not a right and education is not a right. Rights are only what can’t be taken away by government – Life, Liberty, and the Pursuit of Happiness. We have allowed those in government to ignore every aspect of the Constitution it finds inconvenient. The choices are clear: do you want government control of every aspect of your life, or do you want to be free to create your own utopia. One of these made America a great country the world flocked to. Are you going to let it die? ObamaCare is an American tragedy. Congressmen were lied to, backroom deals were made, the people didn’t want it, congressmen didn’t read it, but the Democrats crammed it down our throats. Businesses are afraid to hire because of uncertainty, health insurance premiums have skyrocketed, and small health insurance providers are out of business. Worse: Congress has made itself immaterial. They subjugated their responsibility for writing laws to unelected bureaucrats, and the unelected are thrilled to socially engineer 19% of GDP – fundamental transformation. Asking government to solve problems is like asking heroin addicts to pay the rent and buy groceries before cruising for another fix. Government will not accept limits on power unless slapped down, but that doesn’t stop them from adjusting tactics. Think HilliaryCare. The Constitution, public opinion, the cost, and past failures of like programs are no deterrent. Ideology must be fulfilled at any cost. ObamaCare is an example on the national level, but the same applies on a local level – think Coliseum (Bloomington Il). Maybe some of us may live long enough to see the Coliseum turn a REAL profit and not be in debt, how many decades do you have left? ObamaCare was not about reforming the health care system. It was an attempt to control behavior of every person in the United States. It was meant to ration care, cutting off the very young and somewhat old because they are not contributing to society-in their opinion. Yes – death panels were in the bill. Kathleen Sebelius must relish writing laws to alienate churches who refuse to fall in line with the agenda. Pensions – used by elected officials to buy votes. The private sector converted to 401K plans, government refused to defer power in favor of common sense. Massive debt – incurred by governments trying to socially engineer their vision of utopia. The housing collapse – blame The Community Reinvestment Act. People had the ability to buy houses with no money down, housing prices rose to unsustainable levels, then the crash. Add in Fannie and Freddie and the destruction was complete. Dan Brady shared a link. John McCabeA shocking situation. Is it possible, a potential sighting of bi-partisanship? Laurie Ann SextonGood information! Thanks for sharing! Diane Sroka Benjamin Every citizen is now $50,350 in debt to the federal government and in Illinois add another $10,939. Expecting this kind of information from government is one reason why. Time to grow up and accept responsibility for your own decisions. Our kids deserve better than to be buried in debt the day they are born! Laurie Ann SextonThe government is to serve and help its citizens. If this information will help many and avoid people having to take crooked auto dealers to court (thus saving taxpayers court costs), then I’m for all this kind of service. Diane Sroka Benjamin Abdicating your responsibility to the government makes you a slave to them. You are saying you aren’t smart enough or can’t find someone smart enough to shop with you. Relying on government for anything just gives them more power. Laurie Ann SextonSo what’s the point of government? I guess that means you take your own garbage to the dump, have your own water well and sewage dump, have created your own roads to ride on and are completely self-sufficient or have paid a private person to do that for you. Diane Sroka BenjaminGetting a little extreme Laurie? The point of government is to ONLY do for you what you can’t do for yourself – not hold your hand through life. Did you see the debt figures? Is that okay with you? Laurie Ann SextonYou were the one who said that relying on the government for anything just gives them more power – not me. I was just pointing out how extreme that statement was. I agree that the debt figures come down. I also think that the government debt is a reflection of society as a whole – look at how much each individual in our country is in debt because people want more and more and aren’t willing to make sacrifices. Same goes true for government. Or if government does try to make cuts any cuts people cry foul. Try closing prisons- foul. Try cutting medicaid/Medicare – foul. Try cutting education budget – foul. And btw – putting together a document that will help me understand my legal rights when buying a vehicle is not holding my hand – it’s empowering me and helping me to become a more informed consumer. Diane Sroka Benjamin And there isn’t anybody but government in the whole country who can help you buy a car? These people never considered NOT relying on government, heard of Google? They never considered how much they pay through taxes for this un-essential service. Evidently, Rep Dan Brady doesn’t either. With an already extensive list of things government screwed up, why trust government on how to buy a car? But, back to ObamaCare. We now have over 150 new boards complete with bureaucrats to implement the law. Billions of dollars have been spent to implement it. Medicare payments have been cut to pay for it. The Congressional Budget Office has estimated the cost at $1.76 trillion over 10 years. Employers still have mandates. Religious organizations still have mandates. Will everything already in place evaporate when the Republicans over-turn it? How can inept government unravel the mess they made? Here’s a suggestions: The only way to fix the health care system is to let the free markets control costs. Insurance needs to be available across state lines, medical savings accounts should be more available, and insurance should only cover catastrophic medical issues. All medical expenses would drop in price if people were paying for it themselves. Lasik eye surgery is a good examples of how the free market works. It came down in price because it isn’t covered by insurance. Doctors wouldn’t run so many tests if the patient was paying and said “I don’t want that test”. REAL fundamental transformation! It is time to put common sense into health care, government out and people in. We The People need to understand what the role of government is. Social engineering to create utopia is a failed model, tell them we can create our own utopia. Ronald Reagan was right “. . .government is not a solution to our problem, government is the problem.” Why do politicians love to quote Reagan, then do the opposite? Maybe next we should tell government how we feel about “Green Energy”. I ‘m not celebrating this turn for Romney until November, even then it will be brief. Side Note: In Illinois and around 30 other states, children were already able to stay on their parents health insurance until age 26, but why bother with facts when scare tactics are more effective! Posted in Local, National, State.Tagged Catholic church, Congress, Dan brady, dealth panels, fundemntal Transformation, GOP, government, health care, Ideology, Il GOP, KillTheBill, ObamaCare, Pensions, Sebelius, Supreme Court, Unconstitutional, utopia. I’ll take socialism over the theocratic fascism offered by the Republican party any day of the week. How about free market? Why settle for something that has never worked anywhere? Socialized a.k.a Universal Healthcare is a reality all over the world, and has, and is, working. Research is your friend. wikipedia? The site where people can enter anything they want? Why do people with serious illnesses come here? See the picture I added to the bottom of the blog – wait time in Canada. 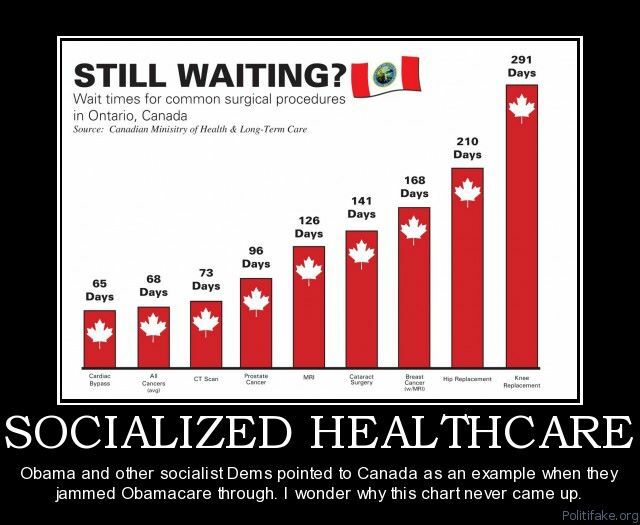 Socialized medicine is great – if you aren’t sick! A study published in the science journal Nature in 2005 found Wikipedia to be as reliable as the Encyclopedia Britannica. If you feel you can’t trust it, then you are denying yourself a very good source for information. Your loss. 1. Per capita expenditures on healthcare in the US is more than twice what it is in Canada. 3. Life expectancy is higher in Canada. 4. Infant mortality is lower in Canada. Your article claims that more than 60% of the population wants the healthcare law repealed. What is your source for that percentage? Your source is a bit out of date, and predictably, doesn’t link directly to the location of said poll, so there’s no way to verify the numbers. Previous Post Illegal Immigration – let’s solve it!